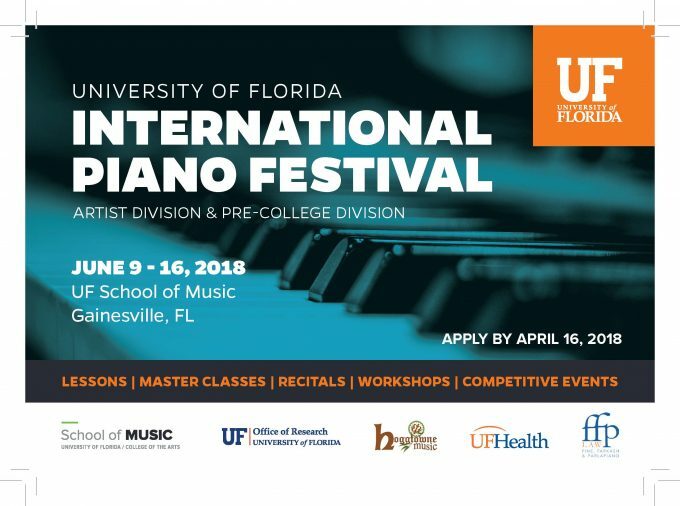 The University of Florida International Piano Festival (UFIPF), sponsored by the University of Florida (UF), UF School of Music, UF Office of Research, UF Health, Hoggtowne Music, and FFP Law will be held June 9-16, 2018. UFIPF assembles outstanding college and pre-college pianists for lessons and master classes with distinguished teachers from across North America and China. The public is invited to attend free daily master classes and recitals. For the full schedule of events, visit www.arts.ufl.edu/pianofestival.